Kelly Kitchens, founder of MacLife, was the guest speaker at my college backpacking class recently, and brought us up to date with the state of the art when it comes to ultralight backpacking. Kelly and others who practice this discipline get their pack down to 17.68 pounds for an overnight trip, including food. This is in contrast to the usual backpack weighing in at more like 30 pounds. The secret: don't take anything you can do without. 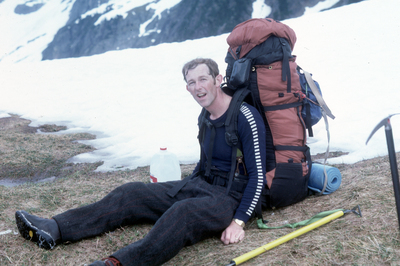 I thought I was already practicing that rule, but too often my pack felt like my partner Mark Gibson's (below) when we did the Ptarmigan Traverse many years ago. Some ways to achieve the 17.68 pound packweight: a 10 oz backpack, a tarp instead of a tent, a tiny MSR water treatment pen instead of a water filter, a super light sleeping pad, a pop can alcohol stove (similar to a Trangia) instead of something like a Snow Peak or an MSR stove, a tiny headlamp like the Petzl Zipka, and a super light down sleeping bag. What a great website! I just added this to my RSS reader. As the CTO of a software startup in Seattle - I'm all too familiar with the patent process and personally find it long and arduous. I think that's the nature of software patents - highly technical and down in the weeds. Some of the outdoor patent are (dare I say it) actually a fun read! It would be cool if you had links on your posts to google patent search to save cutting & pasting the app number. I thought I'd comment on this post in particular to encourage you to consider the ultralight path of backpacking. I've been doing it for many years and it has been more than liberating. My gear list and trail notes can be seen on my blog at www.brettonstuff.com if you're interested. My base pack weight is down under 10lbs. Anyway - cool site - keep up the good work. Anyone looking to make their own ultralight sleeping bag or jacket with down fill, be sure to check out sevenwondersdown.com as they sell loose goose down fill, Hungarian white 600+ and 800+ fill by the ounce and pound. It is hard to find goose down for sale in a raw material form and if you are handy you can sew your own bag and save big bucks, not to mention customizing it to exactly your needs! Have a look at www.ribzwear.com The pack can help in making the transition to ultralight or just make ultralighting a lot simpler as well. Cool stuff.